A restructured Harworth Estates is expected to apply for detailed planning consent for the new district centre at its Waverley development in Rotherham in 2015, with construction expected to start in 2016. One of the largest property and regeneration companies across the North of England and the Midlands, Harworth Estates is set to be completely owned by Coalfield Resources plc as terms have been agreed for a £150m deal. Based on its flagship development at Waverley in Rotherham, Harworth manages around 31,370 acres across some 200 projects, with consent for 8,000 new homes. By regenerating former coalfields and brownfield land, net assets have increased to £249m from £235m in 2013, on a property portfolio value of £290m, up from £277m in 2013. Net profit before tax for the year ended December 31 2014 was approximately £3.5m. Coalfield Resources proposes to raise approximately £115m which will be used to fund the purchase of the remaining 75.1% of Harworth and provide additional investment capital. The £150m deal represents an approximate 20% discount to the net asset value of Harworth Estates and the placing and offer are being fully underwritten by bank and asset manager, Investec. Harworth's debt has been refinanced, on substantially improved terms. A new £65m, five year bank facility (£60m revolving credit facility and £5m bond facility) was secured with Royal Bank of Scotland recently which paid off existing bank facilities and should allow more financing flexibility. The site of the former Orgreave coking works, Waverley is currently South Yorkshire's largest mixed-use brownfield development at 740 acres (of which 430 acres relate to development acres). Outline planning consent is in place for 3,890 homes to be built across 225 acres, and 241 new homes have already been built and occupied since December 2012. 300 acres have also been allocated for high quality public open space. 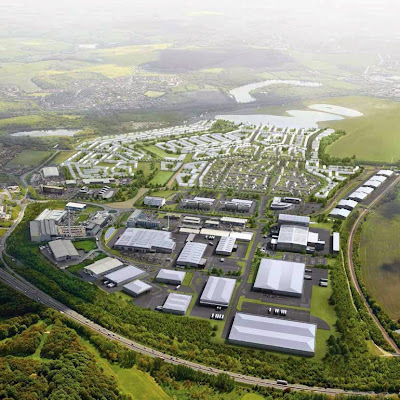 It is also home to the Advanced Manufacturing Park (AMP) and the council's local plan estimates that Waverley could provide employment development in the region of 1.65 million sq ft, 711,252 sq ft of which is already home to employers such as Boeing and Rolls-Royce. As houses and commercial premises continue to be built at pace, the next important phase is for the district centre. Outline approval includes plans for a hotel and wide range of shops, cafés, health, leisure and educational facilities. There is around 187 acres remaining for development with approximately 143 acres for residential, the balance set for employment, retail, commercial and community. Outline plans for a large office campus on the site, with enough space for 2,000 staff, were approved but changes in government and large scale cuts meant that the plans were shelved. Harworth Estates has had discussions with senior officers at Rotherham Council regarding the potential for the site, known as Highfield Commercial, to come forward for non-employment uses (including housing, retail and hotel uses). Also at Waverley, the proposed HS2 line would impact an area which is designated for housing plots in the later stages of the development plan. If the national infrastructure project goes ahead the masterplan would be redesigned to mitigate impacts and Harworth would be due compensation.